So Which Child Shouldn't Be There? One can use twitter to get to the heart of the issue, and Laura Ingraham certainly did that with this cutting comment about Texas State Senator Wendy Davis who led a filibuster against late term abortions. Let's begin with three babies: the first baby survives a premature birth and is treated in NICU, the second baby continues to stay in the mother’s womb to birth, and the third baby is aborted in gruesome fashion by being partially born before being murdered. Now let’s do an exercise and begin with a question, when does the baby become human and a person worthy of constitutional protection? The first baby is born prematurely, but in today’s medical world the baby is rushed toward a Neonatology Intensive Care Unit where doctors keep the baby alive for another 8 to 10 weeks before allowing the baby to go home. The second baby is merely called a fetus since it is still within the confine of the mother’s womb. The mother still can abort the child, and the child has no recourse, whereas baby number one is not only being saved, but to murder that baby after being born would land a doctor in jail for murder. So baby one is considered human and a person worthy of protection, but baby two is not, neither by law or the present societal norm, or at least the norm as advanced by the ruling class. As for baby three, this scene was seen in many abortion clinics, and in Dr. Gosnell’s clinic, babies were actually born before being terminated. So the fact that the baby was actually born did little to protect the baby from the endgame of abortion. 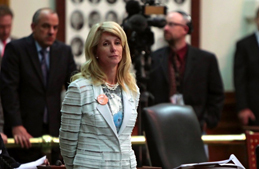 When Wendy Davis protested Texas' attempt to restrict late term abortions, she became the latest darling of the left. Look for her to make her big speech at the 2016 Democratic convention. While many Americans are accepting of abortion in the first trimester where the vast majority of abortions are actually done, Americans are more squeamish since they understand what is in the mother’s womb is closer to being born and certainly looks more human. Ask any mother after viewing a sonogram at the halfway mark of the birthing process if the baby she sees is human or not; they will give you an affirmative answer. They don’t see a fetus but a baby. What if the State of Texas succeeds in restricting abortions 20 weeks and beyond? They would stop approximately 5 to 10% of all abortions, so Ms. Davis is essentially not even willing to restrict a small percentage of legal abortions, abortions that most Americans would agree should be restricted. What we see in the pro-abortion movement is not even willing to stop a minority of the abortions and save around 50 to 100,000 lives a year, and somehow the pro-life movement is the considered the extremist in this debate. Senator Davis is a hero to the pro-abortion movement, but what is she defending? She is defending the destruction of 50 to 100,000 lives and somehow the civil rights of the unborn are the last thing considered by our ruling class. As our little exercise shows, a baby in a NICU is protected, but inside a mother’s womb, there is no true protection. Wendy Davis is working to ensure that. Well, Senator Davis, which little child on the playground can you do without? Join the discussion on Fcebook.